After the success of our Masterbrand campaign, Ballantine's brought us a new challenge. They were launching an American Oak edition of their classic 21 year old blend, but how could we get consumers excited when they don't even know the difference? Many underestimate the role wood plays in the whisky creation process. More than just a container, the barrel imparts a phenomenal amount of flavours and aromas onto the liquid. The oak tree that gives birth to the barrel truly defines the whisky. EVERY FLAVOUR IS AN ECHO OF THE WOOD’S LIFE. 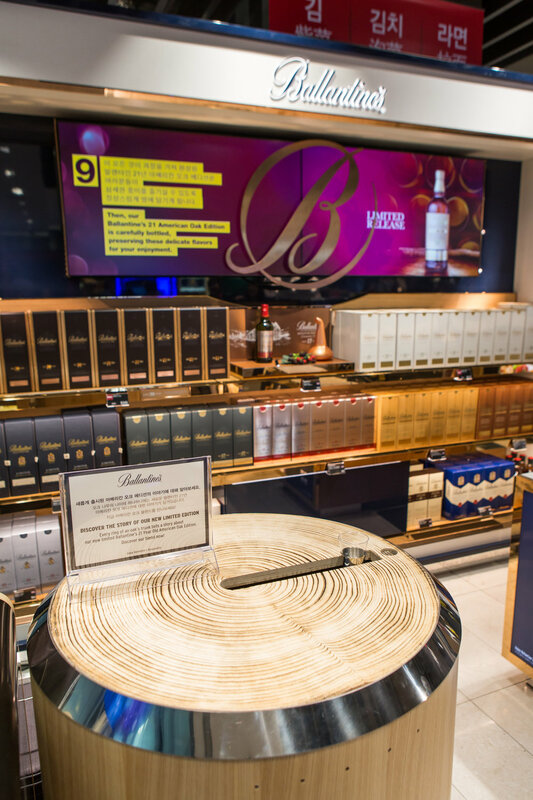 Every ring that marks an oak’s trunk tells a story about our Ballantine’s Signature Oak blend. It’s a story that spans over a century, from the sprouting of a sapling to the crafting of a barrel and the birth of an exceptional whisky. Each ring told a story of how our whisky would taste, and we were determined to uncover that tale. We designed travel retail spaces for Incheon (Korea) and Changi (Singapore) airports. There are a number of unique challenges when designing for travel retail, but the expertise of our 3D team and production vendors allowed us to tackle problems before they even appeared. We were able to design the space while considering the airport's flow of traffic, as well as safety regulations and internet restrictions. Visitors were invited to engage with a tasting experience in-store, where they followed the journey of our blend, from seed, to oak, to barrel, to whisky. Before tasting a free sample, visitors slid their whisky glass across the rings of an interactive tree trunk. As the glass passed each tree ring, the story of our blend came to life in screens around the space. EchoesofWood.com featured a timeline to educate our fans on how the oak's journey from sapling to barrel influences to flavours of Ballantine's 21 American Oak Edition.